Teachings fall into three general categories: insights into and analysis of the central doctrines of the Buddhadharma–the core teachings, original translations of dharma talks and writings by world-renouned Buddhist teachers, and subject-specific articles by Rightview lay and monastic writers. All are in pdf format and you are invited to print any article that may be of interest for further study. Rightview editor and teacher Xianyang Carl Jerome offers his observations and views on timely topics. This link will take you to a comprehensive reading list of Buddhist texts, sutras and poetry. A comprehensive explanation of key Buddhist concepts presented by Editor Xianyang Carl Jerome. The Rightview staff has made a commitment to present previously unpublished translations by Chan Master Yin Shun, Ajahn Buddhadasa, and others. Check back often. Articles by various writers chosen from past issues of Rightview Quarterly magazine. This seated Guanyin Bodhisattva, Liao Dynasty (907-1125) is from the Chinese collection of the Nelson Atkins Museum in Kansas City. 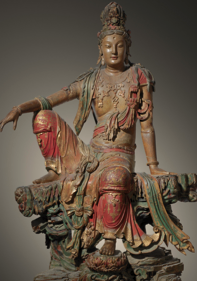 This lifesize polychrome wooden figure of Guanyin is possibly the best-preserved and most magnificent sculpture from this period of Chinese Buddhist art. Guanyin is the bodhisattva architype associated with compassion and is depicted here in a pose of royal ease, gentle and calming, yet ready to reach out at any moment to answer the cries of those suffering. A selection of articles by Zen teacher and abbot of the Cedar Rapids Zen Center, Rev. Zuiko Redding.